Do you remember that cold November in Newport I left two days ago? One of my favorite ways to start the day is an early morning swim before breakfast. It's better than a cup of coffee for wiping off the cobwebs. While out every morning for our 7:00 AM swim we were greeted by scores of locals, out either for their power walks or a swim. Biking and hiking are also very popular among the Bajans. Bicycle riders are everywhere, especially on the weekends. You would think this is Italy. Also like Italians, Bajans take great pride in their appearance. They are a handsome lot. Just after our morning swim, Maureen our cook arrived to prepare us breakfast: scrambled eggs and bacon, fresh mangoes, and at my request, fried plantains. Don't forget to bring home a bottle or two of the locally produced Bajan hot sauce, which tastes fantastic on your eggs. I'm liking this island even more. 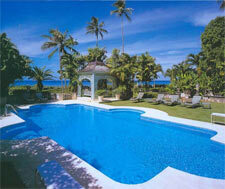 Now its off to see the villas, the wonderful villas of Oz - err, Barbados. We met up with the first of three of our local contacts, Suzy. Suzy brought us around to a selection of new and or refurbished villas that we hadn't seen before. The first villa of the day, 'Barbados villa Foster House', remains my personal favorite of the trip and certainly in the top three of my colleagues. Other personal highlights that day included 'Point of View' and 'Evergreen'. While driving around Barbados, it is evident that the island has a huge middle-class, always a good indication of a nation's prosperity. There are a few decrepit looking "Chattel" houses, but you will often notice that there are two cars in the driveway and a satellite dish on the roof. The Chattel House was originally the design of the plantation worker's home. They were modest wooden buildings set on blocks so that they could be easily moved from one lease holding to another. In early settlement days, homeowners were not necessarily landowners, but part of a tenantry system of the plantations. The houses were constructed to be transportable in the event of landlord and tenant disputes. After touring a half a dozen villas, we broke for lunch and dined at The Tides restaurant. Even though the blackened dolphin and the waterfront location was spellbinding, I didn't want to miss an opportunity to get a long time Bajan's insight into this very special island. I asked our host, Mr. Nick, a long time real estate developer and Suzy's employer, to what he attributed Barbados' prosperity. I was comparing other former British outposts in the Caribbean that had not been as blessed as his country. He replied, "Education, conservatism and a devotion to one's faith." Everyone attends church on Sunday - everyone. That night we decided to stay in and enjoy Maureen's specialty and Barbados' national dish, Flying Fish. The next morning we had to depart from '' and move into our new residence, 'Villa Caprice', all before 9:00AM and a full-days work. After moving into 'Caprice' we met up with another of our local contacts, Allyson, a gorgeous Bajan beauty. We toured another six villas before lunch. The villas we toured that day were of a different nature; 'Fustic House', 'Nelson Gay' and 'Leamington Pavilion' exude a regality that transcends time and place. These villas are in a class all their own. With service staffs that include a butler and a chef, these great houses are more enclaves or retreats where you can escape to an oasis of private luxury. That afternoon the owner of 'Nelson Gay' invited us to join he and his wife for dinner that evening at the villa. I thought, thank God, I brought my blue blazer! Dining under the stars in the gazebo was truly magical. Our menu consisted of Callaloo soup for the first course, Baked Dolphin with Christophenes and Lyonaise potatoes for the main course and Bananas Flambé for dessert! Did I mention the cheese course? 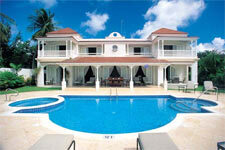 This isn't my fantasy; this is what it's like when you rent a villa in Barbados! I'm glad Glenn cautioned me about my dinner jacket. It wasn't necessary.